The Australian Labor Government under Prime Minister Bob Hawke and Treasurer Paul Keating floated the Australian dollar on 12th December 1983. They did this to make our currency more competitive and to give it the freedom to respond to changes in the global and local economy. Since then, it has been doing just that. Since the start of the Global Financial Crisis in late 2007, foreign currencies have lost value, making our currency more valuable relative to theirs. The USA along with the UK, Eurozone and Japan embarked on a program of drastic interest rate cuts and Quantitative Easing as part of their desperate attempts to kick-start their economies. Both of these actions have reduced the value of their currencies on the foreign currency markets. Australia’s economy has been much healthier, so those measures like those were not needed here. In addition the the weakness of foreign currencies, other factors have worked to push the Australian dollar upwards. Australian resources have been in high demand over the last few years, mainly from China – a very rapidly growing economy. Australia has also been a major gold producing country and the price of gold has also surged over the years from $273 at the end of 2000 to $1579 today. Therefore, newspaper reports calling ours the “most overvalued currency” are complete hogwash. Australians have traditionally been overcharged for many imported consumer goods. The previously low Australian dollar and our remoteness from the rest of the world were frequently cited as excuses for local and foreign-owned outlets to charge higher prices to Australians. The emergence of e-commerce and digitally-delivered products, combined with the appreciation of the Australian dollar, have exposed these excuses for the fallacies that they truly are. With the increased patronage of eBay and other overseas-based online stores, a number of large local retailers like Harvey Norman have been forced to justify or reduce their large mark-ups to consumers. Recently, the Australian government forced Adobe, Apple, Microsoft to appear in front of a committee to explain why Australians are being charged more for software products that can be downloaded over the Internet. I doubt these things would have taken place without the Australian dollar reaching parity with the US dollar. Businesses can purchase imported tools, machinery and computers at vastly improved prices. These high-tech tools can be used to improve quality and productivity, leading to increased economic growth. The property market has crashed in various US and European cities. Astute Australian investors who are cashed-up have been snapping up bargains in these areas. Foreign stock markets have largely recovered from the worst of the GFC, so those who were brave enough to get in early have done very well. The higher Australian dollar has made these even cheaper for locals to invest in. The higher Australian dollar makes it cost less for an Australian business to expand overseas and open a foreign branch, for example, an office or factory in the USA. If this new branch can obtain the materials/goods/ingredients/labour it needs at a competitive price in the foreign currency of the local market, e.g. US dollars, this will further increase the profitability of the foreign branch compared to if they had to ship their materials/goods/ingredients/labour from Australia. Everyone knows that Australia is an expensive place to hire labour – we lost any competitiveness in this area long ago. This is why the local textile industry has largely disappeared and the auto industry is also on its way out. The higher Australian dollar is making it cheaper to outsource manual labour overseas. Australia has become a very expensive place to live, especially here in Sydney. Some people are selling their homes to cash up and relocate to cheaper cities overseas, assisted by the higher Australian dollar. Isn’t the High Australian Dollar Hurting Tourism and Export Businesses? Yes, tourism from GFC-affected countries is taking a hit, as Australia is more expensive to travel to, and the wealth of savings of citizens of GFC-affected countries has dropped – no question about that. My advice to the Australian tourism industry is to concentrate on marketing to the Chinese and South-East Asian countries. It is much cheaper for them to travel here and some of them have gotten quite wealthy during this last decade. On the one hand, you have businesses who import ingredients/materials/components, transform them and resell them overseas. These businesses should not be affected that much, as the cost of their inputs has been reduced and they should be able to pass on their cost savings and drop their prices. On the other hand, you have export businesses who rely on local labour and materials. These include the mining and farming sectors. No doubt they will be hit, but they can still benefit from those things covered in point 3 above. The cold fact is that changes in economic conditions will always result in some people being winners and others being losers to various degrees. What Risks Are There To The Value of the Australian Dollar? Over the last year, we have already seen a huge drop in demand for minerals from China, as indicated by the Mineral Resources Rent Tax hardly raising any money. Stock markets around the world have been recovering. I do not believe that this will be a sustained recovery, as the enormous debt problems of Europe and the USA have yet to be addressed. Nonetheless, a prolonged stock market recovery would reduce the demand for gold, or even lead to the selling of gold, which would likely result in the Australian dollar depreciating. The Reserve Bank is lowering local interest rates far more than I think it should. I believe that they are trying to maintain our expensive property prices. Affordability is very low and a property crash would be devastating. The act of lowering interest rates puts downward pressure on our currency, as it reduces the interest rate differential between Australia and those of key foreign markets – the USA, Europe and Japan. Should the Reserve Bank Actively Intervene to Lower the Australian Dollar? No, I don’t believe it’s appropriate. I would only support their intervention in order to counteract deliberate market manipulation. I advise the Reserve Bank board to keep an eye on George Soros. He has been known to enjoy aggressive speculation on currencies, including the Australian Dollar. Is there Potential for Further Upside to the Australian Dollar? China’s economic growth has slowed over the last year, but it could pick up again – after so many years of growth, it is normal for have a “breather”. This will increase demand for Australian dollar, pushing our currency upwards. America, Europe and Japan have yet to sort out their debt and spending woes. I expect their interest rates to remain low. They may even have more rounds of Quantitative Easing. This will further devalue their currencies and make ours more valuable relative to theirs. if there is an Australian property crash, some people will either have their loans called in and others will be hurriedly trying to reduce their gearing. This will result in a drop in discretionary consumer spending, especially for imported goods. Then again, the Reserve Bank would probably drop interest rates further, so I cannot predict the net effect. In these crazy times we are in, Australia is more or less a democratic, politically stable and financially secure country, distant from much of the strife around the world – we could be considered the Switzerland of the Southern Hemisphere. More people may choose to park their money here in Australian dollars. 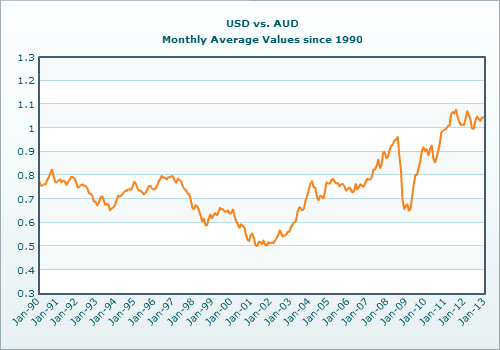 One Comment on Is the Australian Dollar Really Overvalued?